There’s more to coconut oil than coconuts, like how it’s pressed, processed and packaged. Simply GOODFATS Organic Coconut Oil gives you what you want – 100% pure virgin coconut oil from non-GMO coconuts, free from chemicals, mold and toxins. Only fresh, sweet coconuts will do, processed close to the source and purity-tested for ultimate freshness. Our way helps to retain more nutrients including naturally high levels of MCTs and other good fats that support mental clarity, metabolism and radiance. Taste the difference! Get out of the kitchen and explore the infinite uses for coconut oil in health and beauty. Coconut oil for weight loss, whiter teeth, shinier hair and healthier skin are just a few popular uses. Lauric, capric and caprylic acid are fatty acid wonders that get burned as fuel, add moisture and act as natural antifungal and antimicrobial agents. But if you’re using ordinary coconut oil, you may be exposing yourself to mold-related toxins and harsh chemicals used for oil extraction and purification. 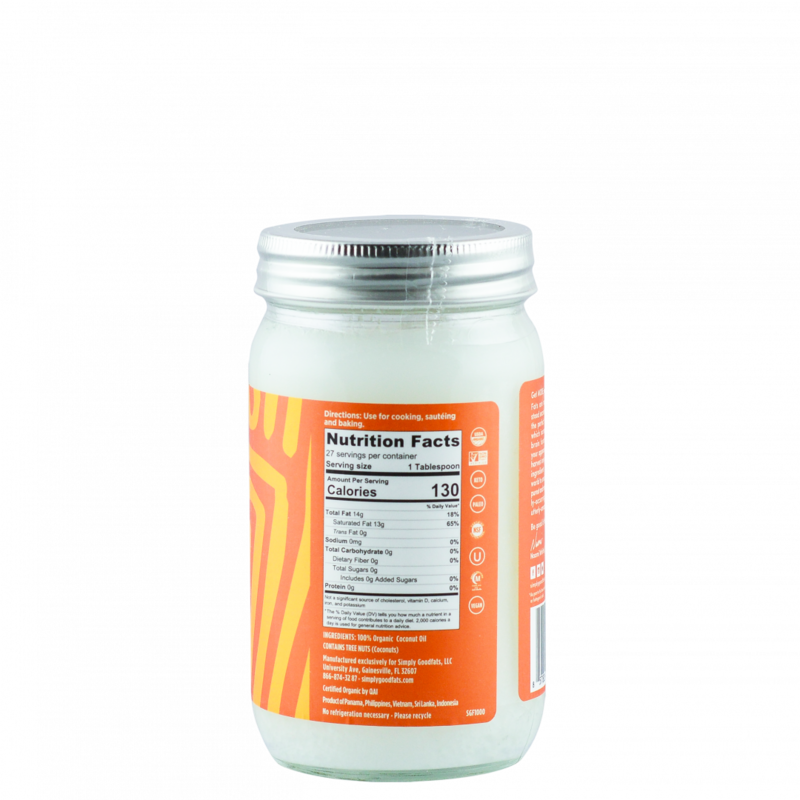 For optimal benefits, use a clean, pure organic 100% coconut oil like Simply GOODFATS. We did the hard work, taking steps (8 of them to be exact) that ensure the oil you receive is wholesome and safe for your body and health. We have exclusive rights to the sweetest coconuts from a small community of growers. Unadulterated soil and perfect climate account for richness you can taste. We retain full flavor, potency and nourishment by cold-pressing our oil from the nutritious fruit. To ensure you get a product that’s clean and pure, we use an 8-step testing process that delivers coconut oil nutrition free from mold, mycotoxins, heavy metals and PHAs. You’ll only find this standard of excellence here. From fruit to jar, we keep it natural. 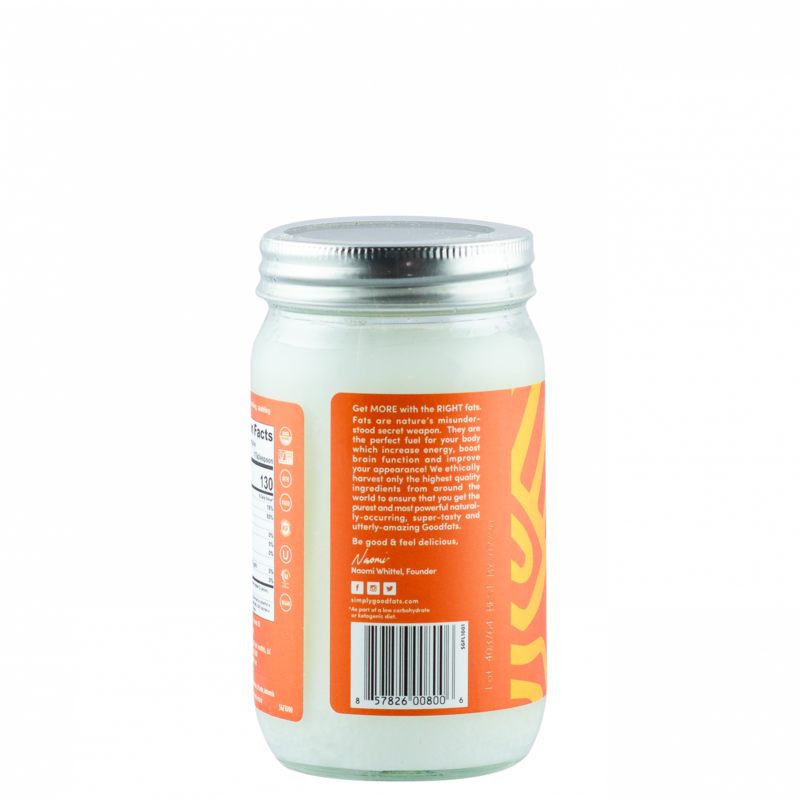 We use recyclable glass jars to preserve the purity of our organic coconut oil and fresh taste. Enjoy the benefits of healthy good fats. 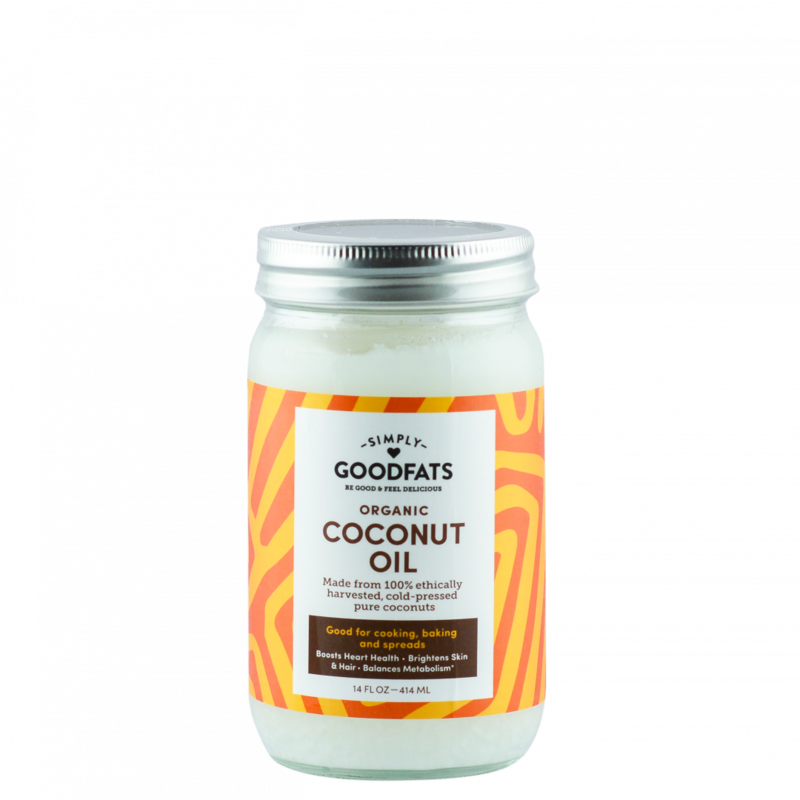 Taste our commitment to purity, quality and freshness in every delicious spoonful of Simply GOODFATS Organic Coconut Oil. Try it. Love it. Guaranteed. Use for cooking, sautéing, and baking. No preheating necessary for these chewy 2-bite treats. Enjoy the flavor of the original confection sans the sugar rush. Satiating, healthy fats from coconut and butter, and filling fiber from nuts and seeds offer a sweet treat to complete any meal. Sugar and spice and everything nice… except when you crave a savory fat bomb. Break off a piece of this healthy fudge when feel like snacking or after a meal when you need something more. It’s as pure as the organic coconut oil it’s made with. Gather your friends for an afternoon of catching-up over this delicious olive oil tapenade. Spread the love of olives and herbs over a toasted slice of keto bread for an appetizer that rivals that of any restaurant. Our coconuts are different from the “other” ones. Learn more about the story of our coconuts. "I've been looking for a true organic, extra virgin, cold pressed, unrefined coconut oil at an affordable price. 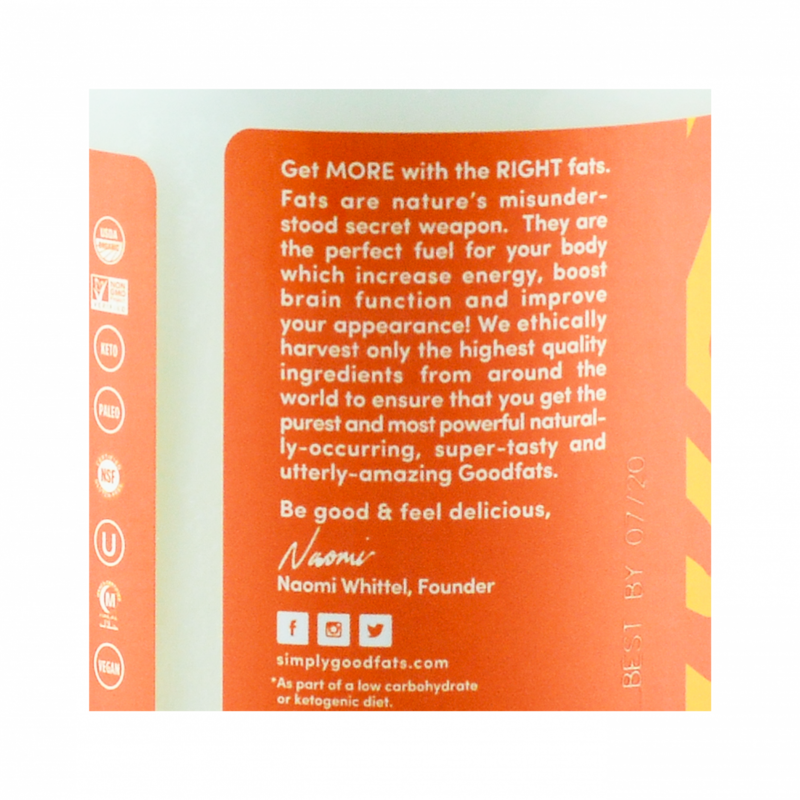 I can taste the coconut flavor and smell the scent very well which is a true sign that it hasn't been over processed or refined." I use coconut oil to sauté foods and as a substitute for butter. It’s not only healthier, it tastes delicious too. We use this oil to cook delicious foods, as well as a natural medicine to prevent and treat many ailments. However, the most popular use would be as a hair conditioner which leaves the hair shiny, soft and silky. It also treats psoriasis, dandruff, chapped skin and lips, and weak brittle nails. It also does wonders for dry skin! You cannot go wrong with this jar. Great price, and a nice amount that will last you a long time, I use it for everything! Coconut oil is a staple in my home. I was interested in trying a different brand but of course I wanted high quality with decent pricing (some brands are just way out on what they charge). I think I found a winner here! Loved the smell, taste and texture. Also, packaging it came in was really nice and fun… felt special. This product is GREAT. I started oil pulling and it helps whiten teeth, improves your mouth health, and it’s good for you! This oil is very good. It is pure and has nothing else added. Trust me, I know what real coconut oil is supposed to look, smell, and taste like, and this is the real deal. I use it on my skin too and it works beautifully.